I’m late because I had the case from hell today and had to prepare til my eyeballs hurt yesterday and last night. So, this is a cop out post. I’m sure you all already know this fact but heck, it’s my blog and I’m gonna tell you it anyway! LOL! 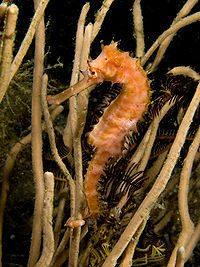 Seahorses are named from the Greek word Hippocamus. Hippo means horse and Kampos meaning sea monster. They are from the Chordata phylum (And I only tell you this part because I have a story with a snow leopard shifter in it. He’s the hero and his name is Chordata- he goes by Cord- Sometimes I can be more clever than is good for me.) Chordata is the phylum for creatures who are vertebrates. I think it’s cool that snow leopards, sea horses and humans are all of the same phylum. But I digress from the fact I wanted to share. I blame the brain damage I suffered last night as I pored over legal texts, so bear with me. Today’s fact is that the male seahorse is the one who gives birth. Yep, tis true. I bet you knew that one already, didn’t you? The female deposits eggs into a sac on the male’s front and he carries them from anywhere from 9-45 days. Once he releases them, they emerge fully formed and his job is done. No nuturing, no child support, nothing. Off he runs to play another day. Today is definitely TGIF for me. I did know that, but I know a little more about it now. Survive the day! Thanks my dear! I’m on the down side of the case from hell now- at least til the final battle on the 13th! He’s a cute seahorse. They are such interesting creatures. I like this fact. Thanks. Yep. He’s a cute dude. Will abandon his kids, but cute nonetheless! Hehehe- had the same conversation with my paralegal yesterday. The human race would be extinct. For sure. LOL! I did know that the male seahorse produced the young but from 9-45 days? That’s quite a span. And, makes me think what male wouldn’t dump the load in 9 days given the opportunity.